King size beds are great for those who need a bit more room to snuggle down at night. Slightly wider and longer than double beds, they cater for those of us who are slightly taller as well. If you can fit a king bed into your bedroom it id definitely worth the purchase. It looks great and you get more space to call 'your side'! Victoria Linen make super soft fitted sheets for king beds. 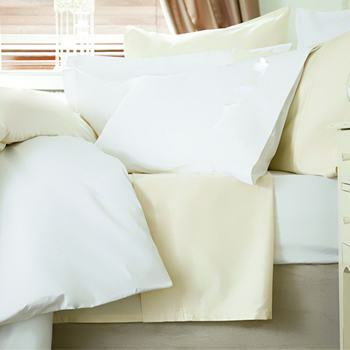 Our sheets are finished with french corners and elastic hem for durability and ease of use. We only use high quality 200, 400 & 1000 Thread Count fabrics when manufacturing. We also make our sheets to any depth to cater for all types of deep mattress or if you have an added topper. Our fabrics are available in a range of colours to suit any bedroom. If you can't find your size or require any samples please call us on 01706 220020 or contact us. King Fitted Sheet in 100% Cotton200 thread count fitted sheet in fine 100% CottonMade to fit 153 x 2..
King Fitted Sheet in 100% Cotton 400 Thread Count - 5' x 6'6"
King Fitted Sheet in 100% Cotton400 Thread Count fitted sheet in 100% CottonMade to fit 153 x 200cm,..
King Fitted Sheet in 100% Cotton FlanneletteRelax in super soft 175gsm fitted sheet in 100% Brushed ..
King Fitted Sheet in 100% Egyptian CottonTightly packed yarns of beautiful Egyptian Cotton.Fine 200 ..
King Fitted Sheet in 100% Mulberry SilkSuperior 100% Mulberry Silk fitted sheet.Luxury Fitted sheet ..
King Fitted Sheet in 1200 Thread Count Cotton - 5' x 6'6"
King Fitted Sheet in 1200 thread countSuperior 1200 thread count fitted sheet in 100% CottonLuxury F..
100% Cotton. King Satin Stripe Fitted Sheet200 Thread Count Cotton sheet in stylish satin stripeAvai..
King Fitted Sheet in Satin Stripe in 4 ColoursLuxury 540 thread count fitted sheet in Egyptian Cotto..
King Fitted Sheet in Poly Cotton - 11 Colours - 5' x 6'6"
UK King Size Fitted Sheet in Poly Cotton - 11 ColoursFitted sheets to fit 5' x 6'6", 153 x 200cm&nbs..
Egyptian Cotton Duvet Cover for 229 x 198cm King DuvetFine 200 Threads to the inch thread count duve..